In this article, the term “UHD” is used for brevity’s sake and refers to 4K Ultra High Definition Television. As is often the case when new consumer products blitz the market, confusion abounds when accurately describing this new TV format. Although the CEA minted the term “Ultra HD,” it is still known as “Super Hi-Vision” by the STRL. Nowadays, thanks to the latest advances in technology, Super Hi-Vision would denote 8K UHD since both use the same pixelated resolution. To muddy the waters further, 4K differs from UHD. Digital Cinema originally had dibs on the term “4K” with a resolution of 4096 x 2160p (8.8 mp). However, Digital Cinema commonly refers to the use of digital technology (i.e., hard drives, internet, Blu-ray, etc) to disseminate motion pictures to cinemas. Given that Digital Cinema resolution is not available for consumer televisions, the CEA coined the term “4K Ultra High Definition.” Note the slight pixel reduction used in UHD for a 16 x 9 aspect ratio. 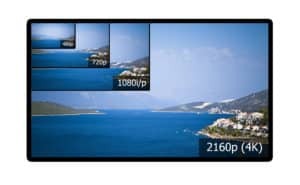 Jamie Lendino of extremetech.com sums up the difference: “The simplest way of defining the difference between 4K and UHD is this: 4K is a professional production and cinema standard, while UHD is a consumer display and broadcast standard.” Just remember that virtually any time you see a TV or monitor advertised as 4K, it’s actually UHD. According to ultrahdtv.net, “10 million homes are expected to have UHD TVs by 2016” so the odds are that you’ll encounter the device sometime somewhere during the next year if you haven’t already. Remember how you gasped in astonishment the first time you saw a picture on a HD TV? Prepare to be truly overwhelmed at the incredible contrast, clarity, color and detail you’ll see on a big screen UHD TV. They’re manufactured and sold by most of the leading brands including Sony, Samsung, Seiki, Sharp and Toshiba. Anticipating the initial dearth of UHD content, Sony has a number of “Mastered in 4K” Blu-ray discs available. They’ve even released a UHD media player pre-loaded with 10 films in “native” UHD; storage can be added by using an external hard drive. (The terms “True UHD” and “Native UHD” describes content that has not been “upscaled” from a lower resolution source – see below.) . More good news: Sony also has a UHD video download service, offering consumers the option to purchase or rent content. As far as sporting events and most television shows (AMC’s Breaking Bad is an exception) are concerned, consumers will have to be patient until the format becomes more widely utilized by networks and other content providers. A “Mastered in 4K” Blu-ray disc is a Full HD (1920 x 1080p) movie upscaled for playback on a UHD player using an upscaling algorithm and hence not “true” or “native” UHD. The disc is sufficiently versatile to be played back on all Blu-ray players and the Sony PlayStation 3. Conversely, a Native UHD disc is mastered and stored in 4K resolution and requires substantially (at least 100 GB are needed for the typical feature movie) more data storage. If you’re buying a Blu-ray player for native UHD movies, make sure you’re getting a newer one that can store the required data or else you’ll need to augment the player by using an external standard hard drive. Older dual-layer models can only store 50 GB. While one would think gamers would be clamoring for UHD (and they are), at this point in the adoption curve it’s only fair to point out the shortcomings with existing hardware. As of May 2015, neither Playstation 4 or Xbox One were capable of native UHD gaming. Thus gamers are obliged to use a PC to get the full visual impact of a UHD monitor. And that PC better have a stout graphics card. The extra pixels put a hefty strain on the typical computer set-up and a game played with all graphics options topped out at 1080p might be playable only at lower settings at UHD. It might even look better at a lower resolution. Bear in mind that native UHD games aren’t yet widely available. So you might not notice much improvement in the picture quality of your favorite game. Here it should be noted that there is a significant difference between the earliest UHD TVs and the latest models, namely the frame per second (fps) rate. The HDMI 1.4 connection standard only goes as high as 30 fps. The newer HDMI 2.0 doubles that rate to 60. According to CNET, an acceptable input lag (think 40 ms) is rarer on a UHD monitor than the fastest 1080p TVs/monitors. Should you get a UHD TV? Absolutely – the question is when. A lot depends on what you want to use it for. If you’re looking for a cinema house movie experience on a 102 inch screen, then what are you waiting for? On the other hand, if you’re more into sitcoms or sporting events or gaming, you might be better advised to hold back for another year or two while the price of this technology falls further and UHD content becomes more widely available. Like it or not, UHD is the next great coming of television viewing. Business Insider magazine predicts that by 2025, over half of U.S. homes are forecast to have a UHD-compatible TV.